Ryan Reynold’s DEADPOOL took the world by storm in February 2016. The raunchy, R-rated humor and action set the film apart from the more straight-forward superhero flicks of the time. However, it still technically took place in the context of Fox’s X-MEN films without affecting the continuity in any grand way. DEADPOOL 2, though, seems to be moving in a completely new direction, using the character’s whacky hijinks to expand Fox’s films into a grander cinematic universe. DEADPOOL 2 looks to add a whole swath of new characters and concepts to the X-MEN franchise. The previous film introduced a new generation of mutants with Negasonic Teenage Warhead. In DEADPOOL 2, though, comic book favorites Cable, X-Force, Black Tom Cassidy, and other important names fill the roster. With all of these concepts and characters, this film is attempting to expand the X-MEN universe in a major way. DEADPOOL 2 seems to want to tie together disparate elements from X-MEN comics and films to build its own cinematic universe. But is this really the case? More importantly, if Fox is looking to mirror the MCU’s success, are they making the right move? X-MEN: Franchise or Cinematic Universe? After the rise of the Marvel Cinematic Universe, we tend to just assume that other superhero franchises are taking them as an example. When DC first released MAN OF STEEL, the idea of using that film as the basis for dozens of other interconnected films seemed crazy. However, this wasn’t always the case. After all, Sam Raimi’s SPIDERMAN series was just that. It was a series, a franchise. It inspired the rise of other superhero properties, namely FANTASTIC FOUR, but these films never connected into what we’d deem a cinematic universe. They were two separate, longstanding franchises that just happened to stem from the same comic book company. That, of course, raises the question about the X-MEN films’ status. Of these other franchises and cinematic universes, X-MEN has run the longest. For the last eighteen years, Fox has been pumping out films in the series. This has led to a continuity so massive that it needed a canon reboot to iron out the creases. I still wouldn’t call the X-MEN series a cinematic universe. After all, their films carry the X-MEN title, and they all revolve around Xavier’s favorite mutants. The only two films that do not carry this brand, WOLVERINE, and LOGAN, aren’t considered as technically canon properties. They exist just outside the world the X-MEN films have constructed. However, we don’t fully know yet how DEADPOOL 2 will fit into this established franchise. It may simply be like LOGAN, set in a world apart from the inspiring films. 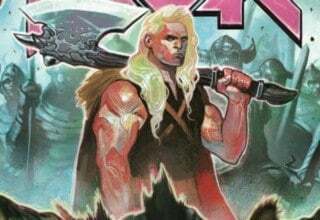 The only way for us to know for sure is if canon X-MEN characters make some appearance in the upcoming film. Nonetheless, this does lead to some interesting questions. If DEADPOOL 2 will exist in the X-MEN universe then this film will introduce so many possible branching points for a cinematic universe. There are a number of reasons why DEADPOOL 2 could represent the birth of a new Fox Cinematic Universe. Whether it be the elements the film will introduce to fans or the character itself, these reasons all have their own merit. Do note, though, that all of this is just speculation. I do argue that DEADPOOL 2 will act as a strong bounding board for potential grand storytelling, but without more information (or seeing the film myself), I have no clue as to the status of this possibility. First and foremost, Deadpool as a character offers a unique opportunity for Fox to develop its own cinematic universe. Originally developed by Rob Liefeld, Deadpool has a long history of comedy and of breaking the fourth wall. In the trailers for DEADPOOL 2 alone, we see Ryan Reynold’s version of the character criticizing the writers and editors of the film in character. He even makes strong allusions to the existence of Hugh Jackman and his character Wolverine throughout the film. This may seem cursory, but it allows the writers and editors to slip in new canon allusions. Do they want to tie Deadpool to an upcoming FANTASTIC FOUR film? Then it wouldn’t be at all unheard of for them to announce said film in a quip from the Merc with a Mouth. Another interesting aspect of Deadpool’s character is that he isn’t a mutant. He is a superpowered individual, yes, and he plays with the mutants on a frequent basis. He doesn’t get his powers from the X-Gene though. This gives the character a greater chance for expansion. He isn’t exclusively tied to the X-MEN franchise. This means that Fox can use Deadpool as a proxy to other films to X-MEN. He can be a unifying factor solely because he stands just outside of the mainstream. It should also be noted that Deadpool already acts as a unifying factor within the X-MEN universe. While his first appearance as a villain in X-MEN ORIGINS: WOLVERINE is widely despised, his current reboot could tie into the world-altering events of X-MEN: DAYS OF FUTURE PAST. They even poke fun at this horrendous version of the character in the first DEADPOOL film, so the building blocks are definitely there. Probably one of the strongest arguments for DEADPOOL 2 forming a new cinematic universe is the inclusion of Cable and the X-Force to the film. Cable, especially, would work as a perfect tie-in character for a cinematic universe. Not only is the character far more serious than Deadpool, his very existence is a tie-in. 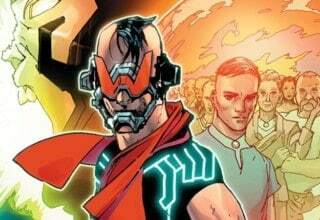 The son of Scott Summers, sent back in time to stop a mutant apocalypse, would be a perfect way to branch the franchise into other realms. More importantly, Cable also stands as the perfect character for a stand-alone film. Seriously, what would be cooler than seeing this techno-organic mutant traveling through time to stop bad guys for two hours? Just take my money already, Fox! Another brilliant opportunity for Fox comes in the introduction of X-Force. 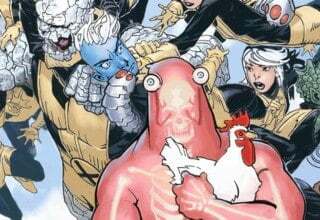 While originally created alongside Cable as the next evolution of the NEW MUTANTS, this team has become something of a unique entity in the comics. Top 10 Weekly Comics News Countdown: DEADPOOL 2, TITANS, Jean Grey and more! They act as a mutant black ops team, and their stories are some of the darkest and most powerful in the canon. While this version seems to be adapting DEADPOOL 2’s raunchy tone, their introduction here could lead to a grander role later on. Especially with a NEW MUTANTS film coming soon, this might be the perfect time for the spin-off films to be tied directly to the X-MEN canon. More importantly, I need an X-FORCE film just as badly as I need a solo Cable film. The final trailer for DEADPOOL 2 shows a new character with no name. This teenaged boy is seen with glowing hands. Apparently, Cable wants him dead for the ways he affects the future. This kid seems to be the main source of conflict in this film, so it is strange that we know so little about him. If I were a betting man, I’d say there are some interesting connections to an X-FORCE story by Rick Remender. In fact, this narrative, contained in UNCANNY X-FORCE #1-4, is considered one of modern comics’ greatest stories. 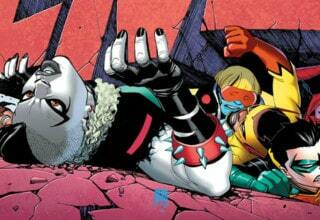 The X-Force team is sent to spy on and rescue a young, teenaged boy kidnapped by an evil cult. Why is this mutant so important? He is the descendant and newest reincarnation of the evil mutant Apocalypse. This speculation may be incredibly far-fetched, but some evidence already seems to be in place. This mutant needs to be powerful enough to draw Cable’s attention, and the powers we see him use in DEADPOOL 2 are incredibly destructive. If this particular speculation is correct, DEADPOOL 2 already connects to the existing film canon. It means that AGE OF APOCALYPSE did occur in this “cinematic universe” and has had lasting ramifications on the story. Now, this particular point has a lot of ifs attached to it. Nonetheless, if the creators of DEADPOOL 2 wanted to develop an X-MEN Cinematic Universe, this would be the way to do it. I personally believe that DEADPOOL 2 will open the doors for a Fox Cinematic Universe. As this is speculation alone, there are a number of reasons why this might not work though. Most of these problems surround potential continuity errors and timeline issues. Still, two, in particular, come to mind. As I mentioned earlier, WOLVERINE and LOGAN don’t necessarily take place in the X-MEN continuity. They take prominent plot beats from that franchise as a basis (i.e. Caliban’s appearance in LOGAN), but neither fits into the universe as is. This also includes FX’s series LEGION. All three of these series use the X-MEN branding in the strictest sense, but none will ever cross-over into the film realm. Now, this might be incorrect with the retconning done in DAYS OF FUTURE PAST. As of this instant, though, all signs point to these three series being separate entities. In a discussion of a cinematic universe, these separate entities act as a blazing sign. It makes viewers question the continuity of every film and movie using the same branding. This is why the MCU hasn’t delved into alternate universes. When you can have three different IRON MAN stories running at the same time without any affecting the others, your entire canon falls apart. The precedent has been set for the X-MEN films. They have explored alternate universes in the past. What’s to stop DEADPOOL 2 from being an entirely separate entity with only thematic impact on the general universe as a whole. I hope this doesn’t happen, but it is a distinct possibility. To be frank, creating a cinematic universe is hard. Right now, long-time fans of the MCU debate long and hard about the timing of certain movies. Does DR. STRANGE’s plot take place before THE AVENGERS? If not, why is his name mentioned in CAPTAIN AMERICA: WINTER SOLDIER? You run into much the same issue as the previous point. If you have an established timeline, i.e. a linear historical view then you need to stick to that outline or risk confusing your fans. 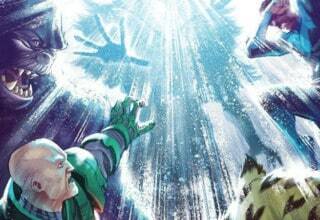 Let’s look past the obvious X-MEN: DAYS OF FUTURE PAST (DoFP) issue. After all, that’s story’s present was set in the past so that they could save the future. The entire point of that film was historical mucking about, so I give it a free pass. All of the X-MEN films to come out after DoFP take place in that same timeline. X-MEN: APOCALYPSE firmly took place in the 1980s. DEADPOOL, meanwhile, takes place in the modern age. This timing can complicate the storytelling process. After all, if DEADPOOL has to base its decisions on the history designed in the X-MEN series then it will be bogged down in constant continuity checks. Fans of DEADPOOL who dislike the X-MEN films will lose out on some key information if they don’t see the precursor films. The MCU handles this fairly well with subtle callbacks. Also, in an internet age, with so many “comic books explained” articles, this issue doesn’t have the same impact. However, the threat to future stories still exists. We have taken a look at both sides of this argument, and in researching this article, I found both to be fairly compelling. As I said, I find myself on the side of DEADPOOL 2 building its own cinematic universe. This does leave out a really important question. Whether or not it is actually developing a shared universe, should DEADPOOL 2 go down this road? Especially with the issues surrounding the DCEU and other burgeoning cinematic universes, should this film even tread these waters? While the DCEU’s cinematic universe has a high-potential of tanking, the X-MEN franchise has something different going for it. The series may not have the same following as the MCU, but it has a long history of producing some above average and some phenomenal films. Fox doesn’t need to build a fan base; they already have one. This means, unlike the DCEU, they can and should jump into character stories with a bit more fervor. They know people will come to their films, so now it is time to throw caution to the wind. Cable and the X-Force could both bring in money like crazy. Especially if X-Force breaks away from the DEADPOOL 2 tones, Fox could have two giants series to round out their cinematic universes. I’ve already expressed my excitement over these two potential franchises, but let me reiterate. In a Cable film, we could get a time-traveling super-soldier bouncing to different time periods with badass sci-fi weaponry. With X-Force, we would see a team of morally questionable mercenaries with super-powers taking the fight (and hundreds of bullets) to their enemies. These films would make money on their own, but tied into the X-MEN franchise, they could draw in two different fan sets. Not only would the film fans show up. The fans of the comics would flock to theaters because their prayers would have finally been answered. These characters are so beloved, so a one-shot simply wouldn’t do them justice. I know I said one major issue against an X-MEN Cinematic Universe was the muddying of time and continuity. This is a definite concern that Fox needs to address should (I mean, when) their cinematic universe comes about. After all, the upcoming DARK PHOENIX story will definitely impact further films in the franchise. The question then becomes, with so many disparate years between DEADPOOL and the new X-MEN films, is there too much continuity to work with? The answer is a definite yes. I still feel like Fox could make this work. Fox Alters Release Dates: What Does This Mean for X-MEN? After DAYS OF FUTURE PAST, fans haven’t been sure about the present continuity of the X-MEN franchise. After all, we have only had one canon entry in the series since the reboot occurred. This means that the series has a whole lot of leg-work to do before its continuity gets ironed out. What if this job didn’t just fall to the X-MEN films, though? What if there was an entire slate of films that explored different corners of this rich and beloved universe? One of the strongest aspects of the MCU is the way its films provide unique and potent portrayals of the same world. BLACK PANTHER, with its rich African heritage, is a fantastic example of this. More X-MEN Cinematic Universe films would simply allow creators to expand on the considerable work done in the X-MEN franchise. Very recently, Fox has announced an entire slate of new films tied into their Marvel movie rights. 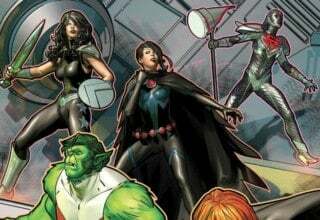 Among these are KITTY PRYDE, THE MULTIPLE MAN, SILVER SURFER, NEW MUTANTS, and DOCTOR DOOM. In this slate alone, we have three different X-MEN spin-offs. Now, imagine these films as facets of a whole, grander narrative. One that has our heroes branching into other aspects of X-MEN canon. Or perhaps branching into the lives of other superheroes. With SILVER SURFER and DOCTOR DOOM films on the horizon, it allows for a broader spectrum of storytelling. If Fox looks to follow the MCU’s popularity, then they have to play into the best part of the films: team-ups. Despite the flop of the new FANTASTIC FOUR film, the comics have made been making a massive come back in recent years. Fans love these characters, but they have never shared a universe with the X-MEN films. However, the inclusion of a newly rebooted FANTASTIC FOUR into the X-MEN canon would lend great credence to this superhero universe. Just imagine Reed Richards and Sue Storm joining the X-Men on a journey to visit Namor the Submariner (a mutant, but with major ties to the F4 comics). Or the Thing duking it out with a less meme-worthy Juggernaut. The possibilities are endless, and Fox would be foolish not to at least give it a try. If it isn’t clear by now, I am completely for a shared X-MEN cinematic universe. There’s just something so slick and clean about the concept. While there are some arguments against this possibility, I firmly believe that what DEADPOOL 2 presents to the general public will attempt to expand the X-MEN mythos into a full-fledged cinematic universe. The possibilities that this brings about are seemingly endless. I’ve listed several above, but I think the coolest aspect has to be the potential for team-ups. I really want to see the X-Men and the Fantastic Four battling Galactus together. Please, Fox. Make that happen! Help support ComicsVerse! Head over to ComiXology to subscribe to the DEADPOOL series from Marvel.